A new project from the MIT Media Lab aims to offer a solution to individuals tasked with keeping track of a wide array of ever-changing data spanning multiple displays. 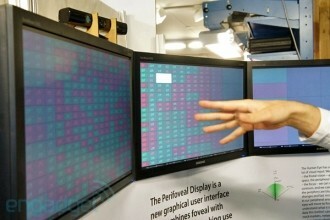 The Perifoveal Display uses Microsoft Kinect cameras and special detection software to help highlight changes in data within your peripheral vision. The Kinect cameras determine which monitor the user is facing and maintains a normal brightness on that screen. When the user moves their head to face another LCD, that panel is illuminated while the other monitor is seemingly dimmed. Any relevant information on a secondary display (or displays) will be highlighted with a white glow designed to catch the user’s attention via peripheral vision. Engadget recently spent some time with the Perifoveal Display and while they said everything worked as-advertised, the response time that one might expect from such a system simply wasn’t there… yet. In case you were wondering, it seems that this product has its sights set on working professionals like financial analysts monitoring dozens of stocks, security guards panning multiple camera feeds and transit dispatchers shuffling any number of calls or tasks. There’s no release date on such a product and based on Engadget’s comments, it could likely stand to use some fine-tuning before the system could be truly useful in the field. Either way, the technology looks promising and showcases just another example of what can be done with Microsoft’s Kinect and a bit of innovation.